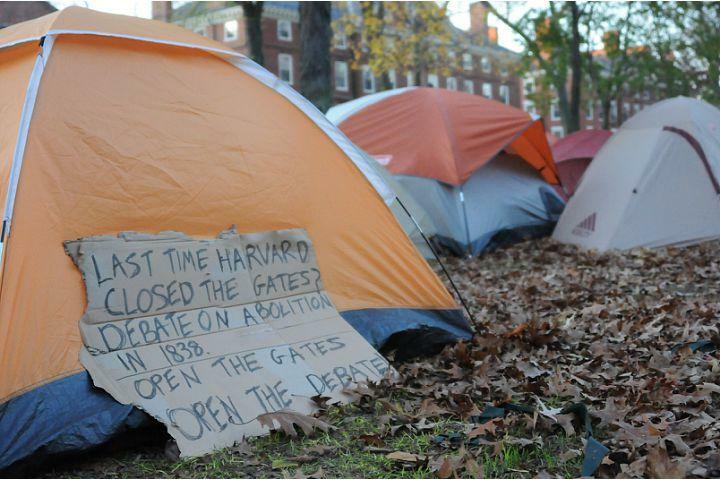 Occupy Harvard supporters passed a proposal Monday to remove the tents from the Yard next week. According to protesters, the decampment is the result of efforts to push the movement into “a new phase of activism,” according to Summer A. Shafer, an Occupy Harvard supporter. Protesters will meet with University administrators on Monday morning to discuss opening the gates when the proposal to vacate the tents takes effect. “Seeing the gates open is something many, many people in the movement want,” Shafer said. The University has closed the Yard to non-Harvard affiliates since Occupy pitched its tents on Nov. 9. “Occupy Harvard 2.0,” as the reconfiguration is being called, will still maintain a presence in the Yard for an undetermined amount of time. While Occupy members will pack up their tents, the weatherized geodesic dome will remain. The dome was donated by MIT supporters over Thanksgiving break and has been outfitted with a tarp to create a warm area for Occupy Harvard supporters. Occupy members say they have not determined how they will use the dome, but they have floated ideas of using it as a movement hub, a space for the information desk, or even as a weatherized place to sleep. During a general assembly Thursday, supporters explained that the agreement to get rid of the tents was not due to administrative pressure. They said the decision was made in the face of impending winter weather and the inconvenience many people said they have experienced as a result of the closed gates. Cambridge resident Vince Dixon, who runs Cambridge Advantage Tours, attended the general assembly and said the closed gates have hurt his business. “Nobody is going to make up my business losses,” Dixon said. Many Occupy Harvard protesters said they sympathized with Dixon and invited him to join the meeting on Monday with administrators. Bridges added that some protesters hope that the administration will open the gates as the movement transitions into Occupy Harvard 2.0. Over winter break, an undetermined number of Occupy Harvard supporters will stay in the area to guard the remaining supplies and staff the information desk in the Yard. Those who will remain said that keeping the movement’s momentum over the break is important to them. The protesters have presented the University with a series of demands, including negotiating a just contract with the University’s custodial workers, withdrawing investments from corporations such as HEI Hotels & Resorts, and increasing diversity among graduate school faculty and students. Harvard has since renegotiated a contract with custodial workers, and University Executive Vice President Katherine N. Lapp announced Friday that the Harvard Management Company is currently reviewing HEI’s business practices.